Once again, two miniatures for the price of one. 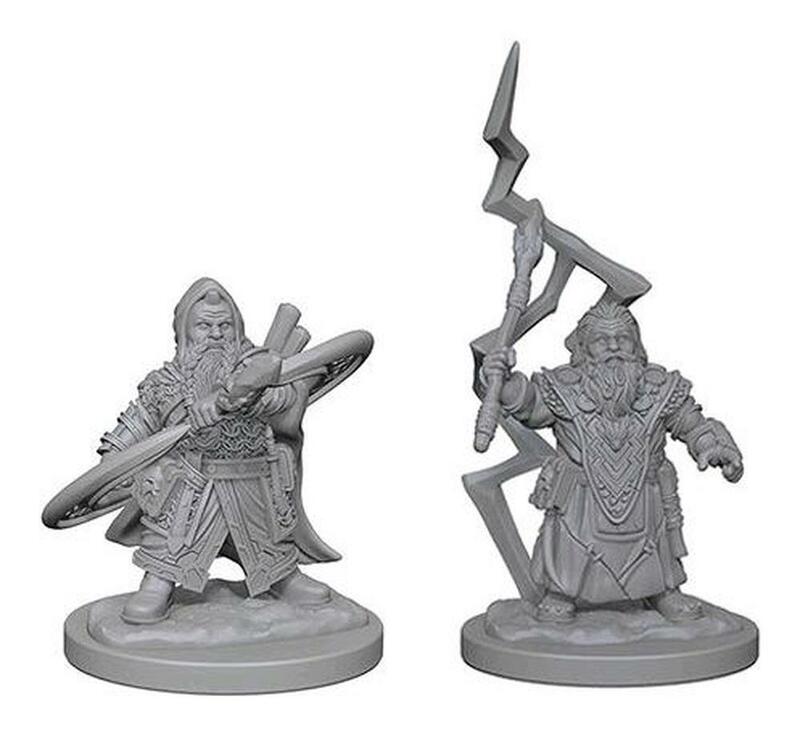 I think the one summoning lightning looks much more druidish, and just like the one before before, this one comes with transparent parts! But first things first: washing, cleaning mold lines and giving it a coat of black wash to establish the shadows. That being done, it’s on to base colors. Since he is a druid, let’s make his main colours greens and browns. I had settled on giving him green beard and hair, but at the same time I was afraid that would make then blend into his clothes. The result is a bit… meh, but I did not have the time to be fussy. Just had to find a way to differentiate the beard and hair from what the druid was wearing, with a few silver and copper metallics. That… sort of works. Hopefully the washes would make them stand out and separate the dwarf’s features from the vests. And more importantly… time to paint the lightning! This one turned out a bit more blotchy than the Tiefling’s snakes, since I didn’t spend as much time making sure the ink settled in the right places. I still ahd two more miniatures to get through that same afternoon, and time was running out, so a “good enough” would have to suffice. I can’t say I am entirely disappointed with the miniature, but I could have picked a better colour palette. Even if I had just shifted the green tones, using different shades for different parts of the miniature in order to bring out the detail more, it would have looked much better. Lesson learned and onto the next one.